The burst of scholarship on colonial studies in the last two decades—crossing the disciplinary boundaries of literature, anthropology, and history—has begun to fill one of the most notable blind spots in the Western world's examination of its history. Yet there is something strange about the timing: scholarly interest in colonialism arose when colonial empires had already lost their international legitimacy and ceased to be viable forms of political organization. Earlier, when colonialism was an object of mobilization, scholars and intellectuals were most captivated by the drama of liberation movements and the possibilities of "modernization" and "development" for people whom colonialism and racism had excluded from the march of progress. Part of the impetus behind the recent research and writing on colonial situations has been to ensure that this past is not forgotten. But the colonial past is also invoked to teach a lesson about the present, serving to reveal the hypocrisy of Europe's claims to provide models of democratic politics, efficient economic systems, and a rational approach to understanding and changing the world, by connecting these very ideas to the history of imperialism. Such concerns have led some scholars to examine thoughtfully the complex ways in which Europe was made from its colonies and how the very categories by which we understand the colonies' past and the ex-colonies' future were shaped by the process of colonization. Yet a significant part of this body of work has taken colonial studies out of the history whose importance has just been asserted, treating colonialism abstractly, generically, as something to be juxtaposed with an equally flat vision of European "modernity." This side of the field has focused more on stance—on critical examination of the subject position of the scholar and political advocate—than on process, on how the trajectories of a colonizing Europe and a colonized Africa and Asia shaped each other over time. Not only does such an approach obscure the details of colonial history and the experience of people in colonies, but the aspirations and challenges posed by political movements in the colonies over the course of history disappear beneath the ironic gaze that critics have directed toward claims for progress and democracy. The refusal to leave the "colonial" as a neatly bounded, excisable dimension of European history marks an important challenge to historical analysis. Yet unbounding colonialism risks leaving us with a colonial project vaguely situated between 1492 and the 1970s, of varying contents and significance, alongside an equally atemporal "post-Enlightenment" Europe, missing the struggles that reconfigured possibilities and constraints across this period. This is why a reconsideration of colonialism's place in history should both engage deeply with the critical scholarship of the last two decades and insist on moving beyond the limitations that have emerged within it. Europe's ambivalent conquests—oscillating between attempts to project outward its own ways of understanding the world and efforts to demarcate colonizer from colonized, civilized from primitive, core from periphery—made the space of empire into a terrain where concepts were not only imposed but also engaged and contested. From the very moment of the French Revolution, rebels in the plantation colony of Saint Domingue raised the question of whether the Declaration of the Rights of Man and of the Citizen applied to the French empire as well as the French nation, and in so doing, they, as Laurent Dubois puts it, "'universalized' the idea of rights. "1 Ever since, political activism in and about empire has posed not only possibilities of accepting or rejecting the application to colonial worlds of ideas and structures asserted by Europe, but also the possibility, however difficult, of changing the meaning of the basic concepts themselves. Conceptual issues are the focus of this book. How can one study colonial societies, keeping in mind—but not being paralyzed by—the fact that the tools of analysis we use emerged from the history we are trying to examine? Historians' quite recent interest in colonial situations owes much to the influence of literary studies and anthropology; scholarly work on colonial issues gave rise to a cutting-edge interdisciplinary field of scholarship. Yet the basic problem with interdisciplinary scholarship is the same as that within the disciplines: conformism, gatekeeping, conventions that one should publish in the "right" journals—whether the American Political Science Review or Social Text—and cite the right people, be they Gary Becker or Homi Bhabha. The economist—to take the most theoretically monolithic of the disciplines within the American academy—generally has to write within the confines of neoclassical theory and to devise and test abstract models; he or she gets little credit for fieldwork into the complexities of actually experienced economic relations. In cultural studies, the assistant professor is required to decenter, destabilize, and disrupt socially constructed categories and to empower subaltern discourse. To transgress the norm of transgressivity is to be unaware of one's own positionality. The cultural critic may relish her disciplinary hybridity yet have a great deal in common with the economist who thinks that more work within neoclassic models has a higher marginal utility than an excursion into anthropology. Interdisciplinary studies can be impoverished by once provocative constructs that have become clichés, just as a discipline can be narrowed by professional hierarchies, required methodologies, or theoretical conservatism. Interdisciplinary studies have their own pitfalls, in particular credulity toward other fields that do not apply to one's own, such as the historian's belief that a quotation from Geertz means doing anthropology or that a reference to Bakhtin means mastery of literary criticism. One is likely to fall for conventional wisdom in another discipline, miss internal debates, and pick up tidbits without exploring their relationship. The remedy for these difficulties of interdisciplinary work, however, is not disciplinarity but discipline: a more thorough and critical engagement with other fields, a more rigorous and wider reading of social theory that both reconfigures and deepens methodological understandings. Writing on colonialism in the last two decades has had a double—and positive—impact in regard to established verities: calling into question a narrative of progress radiating from Europe that ignored how deeply this history was entwined with overseas conquest, and rejecting the consignment of "non-Europe" to static backwardness regardless of how those regions' fates were shaped by interaction with Europe, including the sidetracking of other modes of change and interaction. The bandwagon effect within colonial studies or postcolonial theory is probably no more severe than in other areas of academic inquiry, but rather is illustrative of a wider problem in intellectual life. Like other new fields, colonial studies has been the object of a dismissive backlash that ignores the insights and the healthy debate within the field—indeed, the considerable heterogeneity that characterizes writing on colonial subjects.4 I hope in these pages to steer between the conformism of the avant-garde and the dismissiveness of the old regime in the study of colonization, colonial history, and decolonization by focusing on specific conceptual and methodological issues. Bashing the Enlightenment and criticizing modernity have become favorite activities within colonial and postcolonial studies. Such positioning has been answered by a defense of modernity and Enlightenment against the barbarians at the gates who threaten the universal principles on which democratic societies are based.5 Debate at such levels of abstraction is unedifying, not least because both sides are content to treat Enlightenment rationality as an icon separated from its historical significance. There is a delicious irony here, for Europeans become the "people without history," a notion once reserved for the colonized. Both sides are content to let unchanging and unmediated images of reason, liberalism, and universality stand in for a much more convoluted trajectory, in which the status and the meaning of such concepts were very much in question.6 The not-so-delicious irony is that the critique of modernity aimed at destabilizing a smug, Europe-centered narrative of progress has ended up preserving this category as a defining characteristic of European history to which all others must respond. Only a more precise historical practice will get us out of the involuted framing of such a debate. In chapter 2, I take up the paradox noted at the beginning of this essay, that scholarly interest in analyzing colonialism peaked at a time when it was no longer a political issue. Its starting point is Georges Balandier's article of 1951, "The Colonial Situation," which was a call for analysis of colonial rule using tools perfected in studying indigenous groups but now directed at the "totality" of coercive, structural, and ideological mechanisms of colonial power. This call—timely as it was—went largely unanswered, because scholars, including Balandier himself, were more fascinated by the possibilities of modernizing societies that had been held back and by the liberation movements themselves. 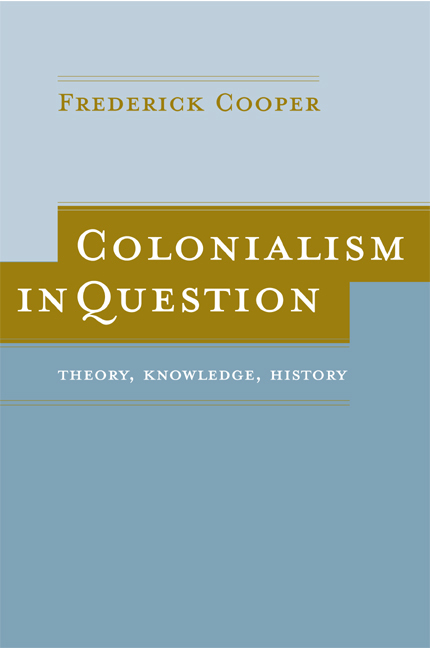 My essay surveys the changing focus of scholarship on colonial societies in the half-century since Balandier's intervention, not as a succession of turns, but as overlapping and often conflicting perspectives, all in relation to the shifting politics of decolonization. Part 2 of this book turns to key concepts that epitomize the current direction of scholarship—in colonial studies and other interdisciplinary endeavors. The use of these concepts has provoked new thinking and important research, but they deserve a scrutiny that the bandwagon effect of scholarly trends has to a large extent repressed. I will examine in detail three concepts—identity, globalization, and modernity—and later in this introduction raise questions about concepts like coloniality, postcoloniality, and post-Enlightenment rationality. In questioning the analytic value of such concepts, my intent is not to step away from the objects of inquiry envisaged by those who use these concepts, but rather to ask if they are adequate to the work at hand. The use of such concepts addresses important subjects: subjectivity and particularity in people's collective vision of themselves, the apparently increasing importance of cross-border interaction in today's world, and the apparent power—for good or for evil—of a view of historical change as moving in a forward direction. In all three cases, I argue, the concepts are important as indigenous categories, as terms used in today's politics and culture. They need to be understood in the often conflicting ways in which they are deployed. The problem comes with scholars' widespread use of these terms as analytic categories, as tools for description and analysis. This usage does more to obscure than to illuminate the problems of social connection, cross-border interaction, and long-term change that they are thought to address. There is nothing inherently wrong in using the same term as both an analytic category and an indigenous one, but there are two problems that need to be confronted if one does so. First, the usefulness of an analytic category doesn't follow from its salience as an indigenous one: such concepts must perform analytic work, distinguishing phenomena and calling attention to important questions. Second, the academic's endeavor to refine and sharpen analytic categories may obscure the ways in which historical actors deployed similar terms, thereby complicating the task of understanding forms of discourse in their own contexts. These chapters address not just the words as such—although in all three cases academic language adds confusion to ordinary English definitions—but the conceptual questions to which writing about them gives rise. To question the analytic usefulness of the category identity is not to presume that people's particularistic and subjective concerns—about gender, ethnicity, or any other form of affinity—should be downplayed in favor of the great universalisms, be they the liberal idea of a citizenry of equivalent individuals or the Marxist idea of class. But understanding how people conceive of commonality, belonging, and affinity does require a precise and differentiated set of concepts. Much recent scholarship on identity uses the same word for something that is claimed to be general but soft—that is, everybody seeks an identity, but identity is fluid, constructed, and contested—and for something that is specific and hard, that is, the assertion that being "Serbian," "Jewish," or "lesbian" implies that other differences within the category should be overlooked in order to facilitate group coherence. This contradictory usage leaves us powerless to examine what scholars most need to understand and explain: why some affinities in some contexts give rise to groups with a hard sense of uniqueness and antagonism to other groups, while in other instances people operate via degrees of affinity and connection, live with shades of grey rather than white and black, and form flexible networks rather than bounded groups. In chapter 3, written by Rogers Brubaker and myself, we do not argue for a more refined or precise word to replace identity, but rather for the use of a range of conceptual tools adequate to understand a range of practices and processes. With globalization and modernity, we again encounter two words and two bodies of scholarships that confuse normative and analytic categories and reinforce the metanarratives that they pretend to take apart. It is hard for anyone who lived through the modernization debates of the 1970s to read the globalization and modernity debates without a sense of déjà vu. The idea that people were being liberated from the stultifying edifice of colonialism or the backwardness of tradition—producing a convergence toward the social practices and living standards of the West—was the hallmark of modernization theory in the 1950s and 1960s. More recently, some pundits and scholars insist that globalization is inevitable as well as desirable. Critics again decry as malignant what advocates insist is beneficial, while some scholars accept the narrative of ever-increasing interaction but deny that it is producing convergence. My argument is neither for nor against globalization; rather, I attempt to reframe the issue, pointing out that the globalization story claims as new what is not new at all, confuses "long-distance" with "global," fails to complement discussion of connections across space with analysis of their limitations, and distorts the history of empires and colonization in order to fit it into a story with a predetermined end.8 The alternative to the concept of globalization is not to reify the state or any other container of interaction, but to detach mechanisms of connection from the artificial notion of globality and to study the marking of territory and the crossing of territorial boundaries in more specific ways than those implied by the linear concept of globalization. The critique of modernization theory that emerged in the 1970s brought out the teleological and Eurocentric nature of the theory. But if the teleology is gone, the telos remains in the form of a burgeoning literature on modernity, colonial modernity, and alternative modernities, the former two with a negative valence instead of a positive one, the latter as the positive, non-Eurocentric reflection of the others. In chapter 5, I argue that the modernity now in question is hopelessly confused by the divergent meanings given to it and that any effort to refine the analytic concept would result in loss of the ability to understand the meanings of modern as an indigenous category—where it was in fact used. The appeal of the modernization concept in the 1970s was above all that it constituted a package, pulling together such changes as urbanization, the growth of market economies, and achievement-oriented status systems. Modernity in the 1990s was still a package, sometimes decried instead of celebrated, sometimes repackaged as "alternative modernities," but still assuming that the alternatives must be modernities. When Partha Chatterjee talks about the "bitter truth" that no one in Europe believes that Indians "could be producers of modernity," he concedes that modernity is what Europe produced.9 The package is still on its pedestal, and debate about a wide range of issues—from the equality of women in society to the desirability of free markets—will be conducted in relation to a presumed distinction between modern and backward rather than in more specific and less teleological terms. As scholars, we need to understand what people mean when they engage in identity politics, when they argue for the inevitability and desirability of the global marketplace, or when they articulate aspirations for clean water and better education. We also need to develop a precise and incisive vocabulary for analyzing affinity, connections, and change. We should try to explain why such concepts evoked passions at some moments but not at others. Colonial elites—sometimes—claimed legitimacy on the grounds that they were remaking Asian or African societies in the image of Europe's self-proclaimed modernity, and at other times they insisted that colonies could never be modern, that they would only go astray if their status hierarchies were undermined, and that European rule was necessary to preserve this conservative order. Such arguments are best analyzed as debates within the history of colonization rather than as a "colonial modernity" located vaguely between the Enlightenment and the present. Understanding indigenous categories—be they those of a French colonial minister, an African trade unionist, or an Islamic religious leader—requires asking how people put their thoughts together; in other words, scholars must make an effort to get out of their own categories. Part 3 develops alternatives to the flattening of time, space, and interaction in the concepts considered above, first via a general argument and then through a case study. Chapter 6 argues that instead of telling a story of the inevitable rise over the last two centuries of the nation-state and the national imagination, one can tell a more revealing story by looking over a longer period of time at a more varied set of political forms. For imperial rulers from the Roman Empire through the Ottoman and Austro-Hungarian Empires to the French Community and the British Commonwealth, governing an imperial polity produced a different set of structures and a different way of imagining political space than did a nation-state. Empires should not be reduced to national polities projecting their power beyond their borders. They always had to balance the incorporation of people and territory and differentiation that maintained the power and sense of coherence of the ruling elite. The chapter puts in a single framework continental and overseas, "modern" and "premodern," European and non-European empires, for all participated in the calculus of balancing incorporation and differentiation, and interacted and competed with each other for resources—but did so in different ways. Similarly, there is much to learn by looking at political mobilization within and against empire not just in terms of a community or nation rallying against an intrusive, distant power. Political movements developed more varied repertoires, including deterritorialized forms of affinity—pan-Africanism, pan-Slavism, pan-Arabism, Islamism, Christian humanitarianism, proletarian internationalism—as well as attempts to reform and restructure the imperial unit itself, often by turning imperial ideology into a claim on the rulers of empire. It was only with the collapse of the last empires in the 1960s that the nation-state became the generalized form of sovereignty. Up to the very end of those empires, some people within them were trying to turn the empires' incorporative needs into demands for imperial resources and for political voice. Empire is, unregrettably, no longer in the political repertoire, but appreciating the recent roots of the nation-state might help to foster more precise discussion of different forms of political organization and their consequences, without falling into the teleology of nation-building, sweeping denunciations of all forms of state power, the use of empire as an epithet for any form of power, or the sentimental reimagining of past empires as models of stern and responsible governance of the fit over the unfit. Chapter 7, based on my research in Senegal and France, provides an example of how both the makers of empire and the leaders of social movements operated within an imperial framework and by using that framework changed it. Labor and political movements in French West Africa in the 1940s and 1950s seized the language of postwar French imperialism—in a moment when France needed more than ever for colonies to be orderly, productive, and legitimate—and turned it into demands for equality of wages, benefits, and ultimately standard of living among all people whom the government asserted to be French. This impeccable logic of equivalence—backed by well-organized protest movements and in the context of worldwide debates over self-determination and anticolonial revolutions in Vietnam and North Africa—presented the French government with the dilemma of either giving up the idea of Greater France or facing its metropolitan citizens with never-ending demands and an unpayable bill. The national conception of France was born of the same process that give rise to nation-states in North and sub-Saharan Africa. The historical profession has without doubt been reinvigorated by challenges to it, coming from new entrants into the academy—not least of all, scholars from Africa and Asia—by ferment in other disciplines, and by the tense but frequently crossed frontier between academic history and diverse people's interest in the past. In my experience and that of many of my generation of professional historians, the study of colonial empires had by the 1970s become one of the deadest of dead fields within history. Students interested in pushing the frontiers of historical research looked to Africa, Asia, or Latin America, or they sought to look at Europe and North America "from the bottom up." The revival of interest in the colonial world a generation later reflects the influence of literature and anthropology and, most importantly, wider intellectual currents that threw into question the most basic narratives and the most basic ways in which knowledge is configured. Historians were having to face the fact that the new challenges were not simply to add an African or Asian component to a previously Europe-centered curriculum, but to think about what we mean by Europe, Africa, Asia, and how they shaped each other over time (see chapter 2). But it is now the interdisciplinary domains of colonial and postcolonial studies that could use a new sense of direction, particularly a more rigorous historical practice. These fields of inquiry have introduced a large and transcontinental public to the place of colonialism in world history. Yet in much of the field, a generic colonialism—located somewhere between 1492 and the 1970s—has been given the decisive role in shaping a postcolonial moment, in which invidious distinctions and exploitation can be condemned and the proliferation of cultural hybridities and the fracturing of cultural boundaries celebrated. Meanwhile, historians can at times be faulted for treating own engagement with sources from the place and time in question as unproblematic, as if sources spoke on their own. The outsider's characterization of academic history as one damn thing after another has a grain of truth. Historians' narratives are built on conventions of narrativity that are not always examined. Nevertheless, the historian's displacement in time itself generates a bias against the homogenization of categories; while some historians narrate the past as if it inevitably led to the present, they still distinguish past from present, and another historian in the same present might interpret that past differently. Historical practice suggests that however varied the impetus and context for the actions of men and women, interactions unfold over time; contexts are reconfigured and shape future possibilities and closures. At least some of the criticism has had a positive effect. The June 2004 congress of the once staid and nationally-focused Society for French Historical Studies included seventeen panels on topics related to colonial history, with nearly four dozen presentations, mostly by young historians with fresh material from archives and other sources that enlarged from colonial vantage points the meanings of citizenship, law, social welfare, and "France" itself. In the following pages, I will point both to the importance of the critique of the historical profession and to its limitations, especially when ahistorical methodologies are deployed to answer questions that are unavoidably historical. Ashis Nandy argues that history is inseparable from its imperialist origins, that it necessarily imposes the imperialist's understanding of people's past over their own. To some scholars, history confines the zigzags of time into linear pathways, privileges state-building over other forms of human connection, and tells a story of progress that inevitably leaves Africans or Asians on the side, lacking some crucial characteristic necessary to attain what is otherwise universal.11 Such arguments are valid criticisms of many histories, but do they amount to an indictment of the study of history itself? In fact, the indictment of history is itself historical. To trace history to imperialism is to give power to a phenomenon that is historically located. The question such an observation leaves is whether it is enough to name imperialism as the dark side of modernity, or if understanding it requires a more searching examination, which in some form is historical. Meanwhile, the practices of many historians may well suggest an "irrevocable link between History and the Nation-State," but the evidence that the nation-state is not so universal is another sort of history, which documents more varied sorts of political imagination.12 Academic history, like all others, has its particularities, and the argument that other visions of the past are more diverse and lively is valid only if one aggregates them—itself a quintessentially academic exercise. Historians' complacency about the European boundaries of their field was shaken up by Edward Said's Orientalism (1978). Said showed how certain visions of Asiatic societies are deeply woven into canonical European literature. Colonization was no longer out there, in exotic places, but in the heart of European culture. Said was soon criticized for presenting such a closed view of the colonized "other" that there was no room for alternative constructions, including those by Arabs, Africans, or South Asians. In his subsequent book, Culture and Imperialism, Said tried to restore balance by emphasizing not the stark separation of European and indigenous discourses but the efforts of colonized intellectuals to work between them and to develop crosscutting languages of liberation.13 Such an argument, too, is a historical one. My focus is on the double occlusion that results from turning the centuries of European colonization overseas into a critique of the Enlightenment, democracy, or modernity. First is the obscuring of European history, for the counterpart of reducing non-Western history to a lack of what the West had is to assume that the West actually had it. All the debate and conflict within post-1789 European history is reduced within the critique of the post-Enlightenment to an essence of modernity, producing a label attached to an entire epoch, and this abstraction is assigned causal weight in shaping what happened in colonies in the nineteenth and twentieth centuries. Second is the occlusion of the history of the people who lived in colonies. Positing a colonial modernity (see chapter 5) reduces the conflicting strategies of colonization to a modernity perhaps never experienced by those being colonized, and gives insufficient weight to the ways in which colonized people sought—not entirely without success—to build lives in the crevices of colonial power, deflecting, appropriating, or reinterpreting the teachings and preachings thrust upon them. Within this line of argument, resistance might be celebrated or subaltern agency applauded, but the idea that struggle actually had effects on the course of colonization is lost in the timelessness of colonial modernity. The Haitian Revolution—and especially the possibility that the Haitian Revolution actually affected the meanings of citizenship or freedom in Europe and the Americas—is as strikingly absent in prominent postcolonial texts as in conventional narratives of European progress.17 The result is that ownership of notions like human rights and citizenship is conceded to Europe—only to be subjected to ironic dismissal for their association with European imperialism. Such a critique has had its value, above all in forcing historians—like anthropologists or other social scientists—to question their own epistemological positions. The question is how one understands and gets beyond the limits inherent in the stance of the critic. Let me turn now to a brief analysis of modes of writing that can be called ahistorical history, which purport to address the relationship of past to present but do so without interrogating the way processes unfold over time. I will mention four modes of looking at history ahistorically: story plucking, leapfrogging legacies, doing history backward, and the epochal fallacy. My purpose is not to defend one discipline or condemn another, for some of the most searching historical questions have been asked by literary critics or anthropologists. Historians are familiar with many ways of doing history ahistorically, not only from criticizing the shortcomings of other disciplines but from engaging in such practices themselves. Nonetheless, theoretical perspectives that operate in vaguely specified temporalities and that give explanatory weight to agentless abstractions—like coloniality and modernity—both depend on and reinforce the methodological shortcomings described below. The "colonial" has itself become an object of study, literary and otherwise—a phenomenon appearing in many places and times. The weighty -ity in such widely used words as coloniality or postcoloniality implies that there is an essence of being colonized independent of what anybody did in a colony.21 One can pluck a text from Spanish America in the sixteenth century, a narrative of the slave colonies of the West Indies in the eighteenth, or a description of moderately prosperous African cocoa planters in the twentieth-century Gold Coast, and compare it to other texts. This gives rise to the question of how far we can go in discussing coloniality when the fact of having been colonized is stressed over context, struggle, and the experience of life in colonies. Colonial power, like any other, was an object of struggle and depended on the material, social, and cultural resources of those involved. Colonizer and colonized are themselves far from immutable constructs, and such categories had to be reproduced by specific actions. At a more abstract level, seeking the genealogy of concepts or ideas also easily turns into a backward-gazing approach to history. Just as an ordinary genealogy starts with "ego" (the person looking backward) and produces a tree of connection, genealogical approaches to ideas look backward to find their roots, sometimes finding them in a discredited colonial past. What gets lost here is the historical context in which concepts emerged, the debates out of which they came, the ways in which they were deflected and appropriated. Genealogical and constructivist approaches when done in a historically grounded way—that is, by working forward—become other words for doing . . . history. To the extent that such approaches both call attention to the non-neutral position of the present-day observer and see the conceptual vision of that observer in historical terms, they are valuable, albeit hardly new.26 Good historical practice should be sensitive to the disjunctures between the frameworks of past actors and present interpreters. In this closely integrated collection of essays on colonialism in world history, Frederick Cooper raises crucial questions about concepts relevant to a wide range of issues in the social sciences and humanities, including identity, globalization, and modernity. Rather than portray the past two centuries as the inevitable movement from empire to nation-state, Cooper places nationalism within a much wider range of imperial and diasporic imaginations, of rulers and ruled alike, well into the twentieth century. He addresses both the insights and the blind spots of colonial studies in an effort to get beyond the tendency in the field to focus on a generic colonialism located sometime between 1492 and the 1960s and somewhere in the "West." Broad-ranging, cogently argued, and with a historical focus that moves from Africa to South Asia to Europe, these essays, most published here for the first time, propose a fuller engagement in the give-and-take of history, not least in the ways in which concepts usually attributed to Western universalism—including citizenship and equality—were defined and reconfigured by political mobilizations in colonial contexts. Frederick Cooper, Professor of History at New York University, is author of Africa since 1940: The Past of the Present (2002) and coeditor, with Ann Laura Stoler, of Tensions of Empire: Colonial Cultures in a Bourgeois World (California, 1997), among other books.